I finally caved and started buying the Friendship Jar series, LOL! I've always thought they were fun, but resisted "going down that road"... until now. I started with the original set and the Spring Fillers. Ohhhh, how I have coveted that beautiful tulip bouquet! So of course, that was the first thing I did. I also used the new Little Labels set and die. I wanted to keep the sentiment small and not cover up the flowers that I worked so hard to color! Check out the striped lower half of the card base... look familiar? I used an image from Half and Half, stamped across the bottom, to add that pattern. 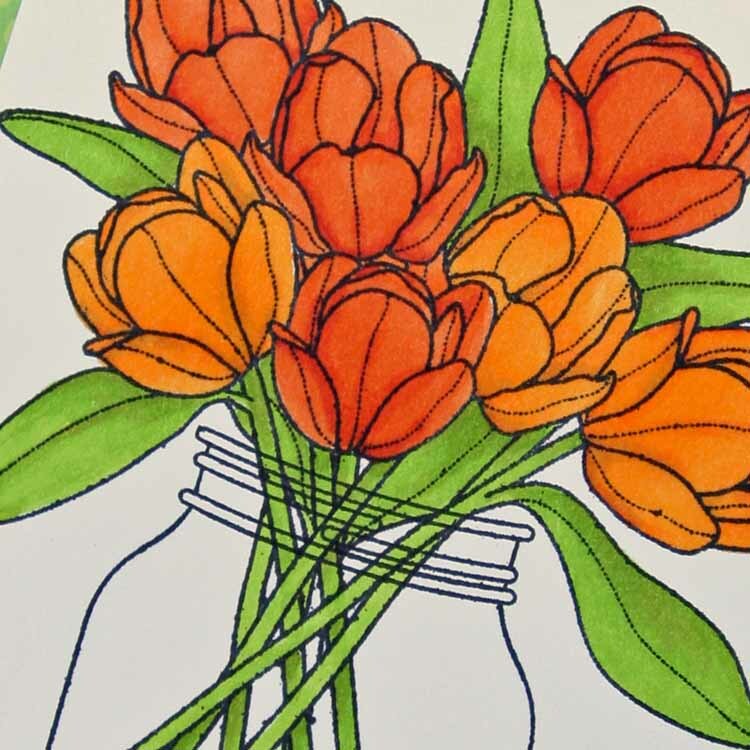 Here is a close-up of the flowers, which I colored with Orange Zest and Summer Sunrise copics (for the most part). Beautiful, just beautiful! Fabulous job coloring. Love this card. Great coloring, and I like everything else you did with the background. Ohhh..this is beautiful. I adore those colors together. Absolutely gorgeous. I love the colors. I have been tossing around the idea of "going down the Friendship Jar road" also. You may have just convinced me. Beautiful, Debbie!! Just beautiful! And I love how you used Half & Half for the background. Beautiful. Love the colors. Creative use of half & half stamps. This looks great, Debbie! Great colouring on the tulips! Pretty card! Beautiful coloring. The Friendship Jar series is one of my favorites from PTI.